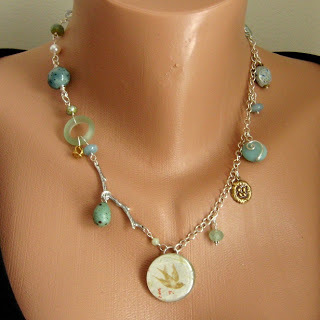 I love robins, nests, spring, aqua, twigs, lots of things that make up this necklace. I don’t usually make asymmetrical pieces, but I had this piece of chain that was too long for a bracelet and I didn’t want to waste the extra, so I thought I’d do half a necklace with it. And one dead-of-winter morning I was laying in bed and I came up with all these bird-themed components, some of which are in this piece and others are in the rest of the collection. I put some blue and some green in there, glass, pearl, stone, a touch of brass, and a couple of speckle-glaized ceramic beads. 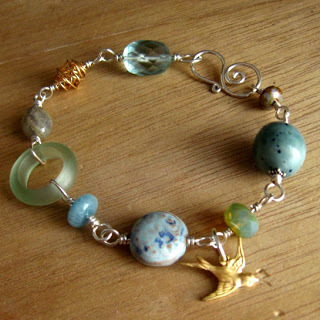 Here is the bracelet ($55, necklace is $125) and I also have a pair of speckled-egg earrings ($26). They’re heading to the wonderful Simply Charming Boutique next week, so if you are interested shoot me an email.